Happy 10 Year Anniversary to the Longest Bull Market in History! 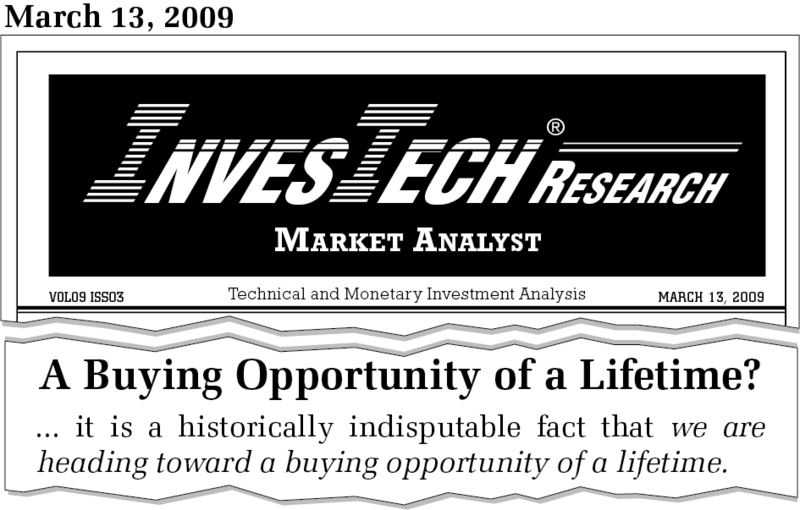 Revisit what InvesTech was saying just 4 days after the Bear Market Bottom in 2009 in the following issue of the InvesTech Research Newsletter. Login or Subscribe Now to read our March 15, 2019 issue of the InvesTech Research Newsletter (available in Current Issues) for our Then versus Now comparison to determine where the market stands today. With InvesTech, you'll find a service with the courage to stand alone against the crowd... to recognize and seize low-risk profit opportunities... and to shield investment capital during treacherous times. Click here to start your subscription today. 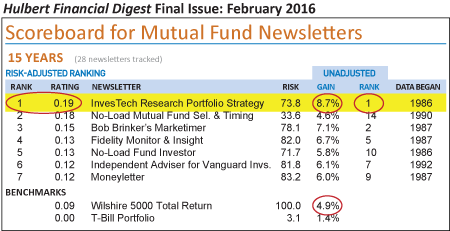 The final issue of the Hulbert Financial Digest, published in February 2016, included the ranking of top mutual fund newsletters and showed that InvesTech Research was #1 in long-term performance –both for risk adjusted and unadjusted performance– with an annualized gain of 8.7% per year… almost double the Wilshire 5000's annual return over the same period. Click Here to view or print this Chart of the Week separately. Professional Asset Management, using a proven strategy that reduces portfolio exposure when market risk is high. Account Options to suit your personal investment profile. Whether you desire dividend income or are more interested in capital growth, Stack Financial Management offers an account objective to meet your needs. Portfolio Management for individual clients, corporations, trusts and retirement plans. Click Here for more information, including account options, fees and how to order a complete information package. Morningstar - Wall Street's #1 source for research on mutual funds. Investors FastTrack - Charting, ranking and analysis software for long-term investors. MoneyShow - A premier source for stock market and financial market information. Live Stream of Big Mountain broadcasting from our New Office!